At The Feed Store/Pet Junction, we offer self-serve pet washes for dogs. We supply all the shampoos, towels, and dryers you need to get your pooch looking his or her best. Our self-serve pet wash is a great way to bond with your furry friend and have fun making new ones. Furthermore, you leave the mess with us, saving your bathroom and hallways from sudsy paw prints! We are happy to offer pet nail clipping services for dogs, cats, and other small animals. Nail clipping takes a lot of skill. For dogs especially, cutting must be precise or you could hit the quick of the nail, causing the animal pain and bleeding. Allow our experts to properly cut your pets’ nails for comfort and convenience. Please call ahead for any enquiries! Our store also provides on-the-spot tag engravings. 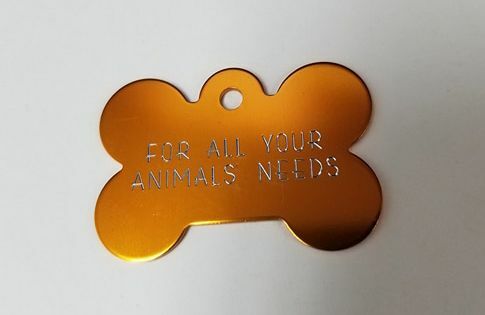 If you’ve just adopted your first pet or need an old tag updated, we have the professional engraving service you need. From clippers to brushes and more, we offer pet grooming supplies to serve all your needs.